Happy Halloween! Shadowhunters season 3, episode 18, “The Beast Within” reveals all sorts of monsters in the shadows. “The Beast Within” allows the Downworlders a night of freedom. To show who and what makes them whole. Glamors are down. Fangs, horns, and werewolves are out for show. But it also provides a unique entry point into the Shadowhunters universe. 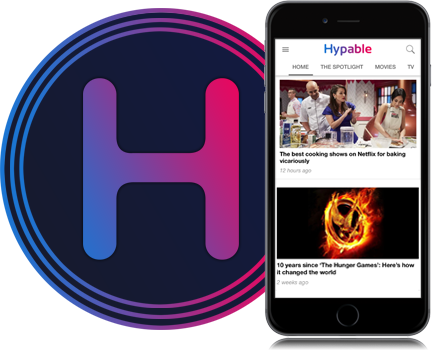 When the Halloween episode was announced back in early 2018, there was some speculation that episode, though not a standalone, could serve as an entry point for new viewers discovering the series. And the reason for that is now clear. Becky Lewis arrives to uphold a time-honored tradition — Halloween with Clary and Simon. The trio, we learn, has celebrated the day with costumes and trick-or-treating for many, many years. But as a vampire and a professional demon-hunter, two of three may have had their fill for a lifetime of dealing with creatures who are certainly not in costume. 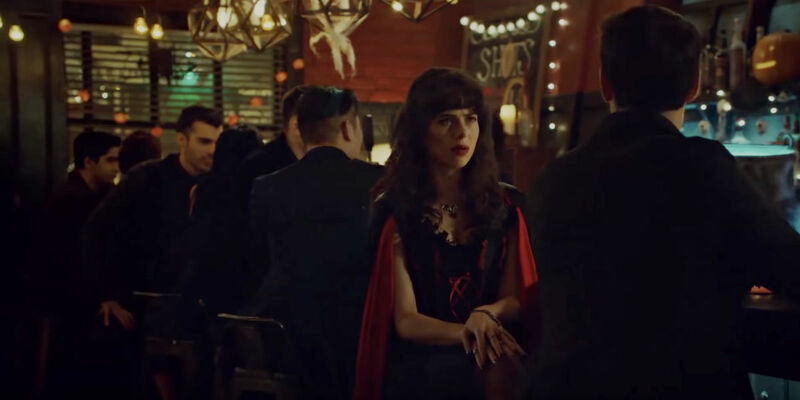 Simon humors his sister’s attempt at levity — donning dollar store fangs and a cape — and uses the night to expand her view of the Downworlders he and Clary have come to know. Becky is the designated perspective that allows the writers to get some new viewers up to speed. Given that this episode would have likely aired during Freeform’s 13 Nights of Halloween, the promotional teaser would have likely included Simon’s descriptions of the various warlocks and werewolves, as well as a cut to Jace’s “I hate Halloween” line. But the episode was not a complete diversion from the story that needs advancing. The humor afforded by Becky’s presence was a nice break in the escalating dire circumstances surrounding the other characters. 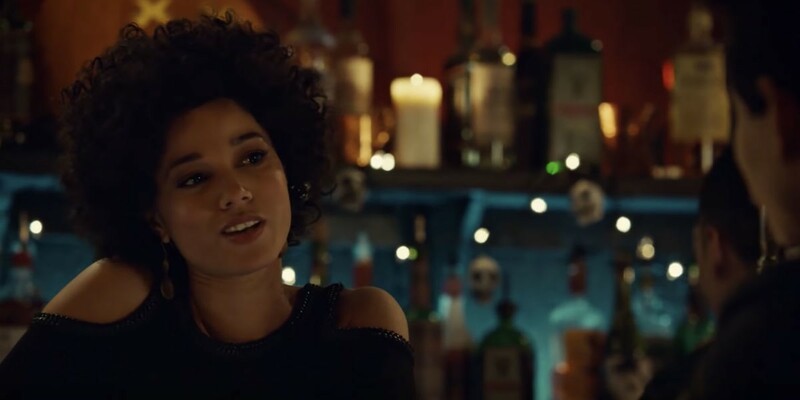 So, while Becky provided levity and an outlet for some exposition, she also aided in moving some key elements along — namely Sizzy. Is Becky the best wing woman ever? To cite one of the best metaphors given to us by How I Met Your Mother, Becky gives Simon is “glass-shattering” moment. One where he can no longer ignore his growing feelings for Isabelle, no matter how committed he is to the single-until-I-die cause. It is adorable to watch him interact with her in the lab as she is full-on business and he is fumbling all around. Alec and Magnus are caught in a vicious cycle of self-sacrifice. Magnus gave up a part of himself to save a part of Alec. Now Alec is giving up a part of himself to save Magnus. One of these resulted in Alec and Magnus at least having each other in the end. This time, however, Alec is losing Magnus as a result. The summoning of Asmodeus, through the warlock Vera, generates an ominous feeling. Alec feels that he is out of options to help Magnus. His first brush with Magnus’ uncertainty about his identity was met with a secret visit and deal to retrieve powers from Lorenzo. The next was met with a drunken confession and breakdown over the loss of a piece of himself. Alec is not turned off by Magnus’ honesty in that moment — he is wounded by it. How could Alec live beside the man he loves for the foreseeable future knowing that he might very well be the cause of his unhappiness? Whatever life they build together, Alec has that feeling built into the foundation. Time is something that is escaping these two in very different ways. Magnus believes there is not enough of it, not enough at least for him to come to terms with his mortality and move forward from it. Alec realizes that there can be time for Magnus to move on and find love again, and that timeline might not include him. Maryse tries her best to ease Magnus’ worry, but decorating the mundane way, even with the person who knows Alec best, does little to soothe the warlock’s sense of loss. The limits that Alec and Magnus place on themselves could likely be overcome together. However, they are both so deeply in love with each other that they are boxed into thinking that the only way to give everything they have to the other requires a loss of self. It is also a testament to their commitment to one another’s happiness. Love is messy and complicated, and Magnus and Alec are certainly not getting caught up in whimsy. There are constant reminders that ground them in reality, making the small moments they share as a couple — the few minutes before work, their breakfasts, a stolen moment in the office — much more impactful. But it doesn’t mean that it isn’t, at times, frustrating to watch. For example, Magnus snuffing out their chance for a serious discussion following his breakdown. Or watching Alec field the hypothetical possibility of losing Magnus with both Jace and Isabelle and then going against their input. On the one hand, he is trusting his instincts. On the other, he is about to break both of their hearts. The final scene between them was crushing, yet beautifully delivered by both Harry Shum Jr. and Matthew Daddario. For now, Malec is no more, Asmodeus is waltzing around the mundane world, and Magnus is about to have a very unwelcome father-son talk. Getting this out of the way now, I am thrilled to see Katherine McNamara play this version of Clary. The unfeeling and manipulative being that woke up at the tail end of the episode is a person with whom I would not want to cross paths. Clary’s connection with Jonathan has been a burden that the people around her have started to bear the weight of. Isabelle was on the receiving end this week when she poked at the issue regarding Clary’s impending separation from Jonathan. 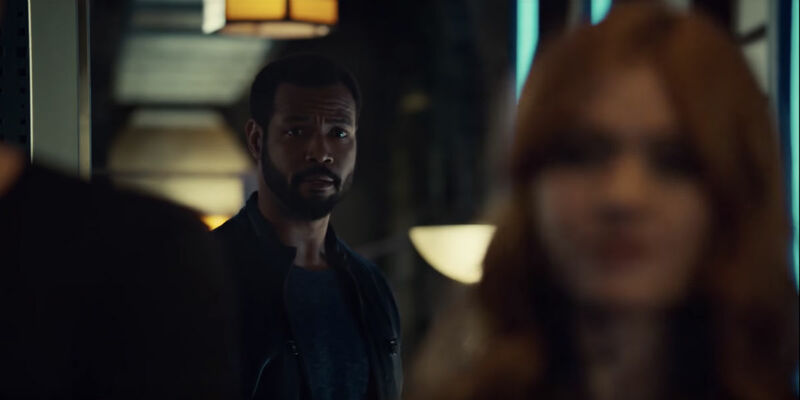 The loss of connection to herself, coupled with the feeling of security offered by the return of Luke, allowed Clary to double down on her commitment to being free of Jonathan. However, when the rune removal did not work as Isabelle had hoped, the door opened for Jonathan and Clary to make the ultimate connection. As Clary gets pushed into a state of unconsciousness by a demon, she gives herself over to him, completely leaning into the demon, rather than angelic, side. In this etherial landscape, Jace appears with his white wings, and Jonathan with his black, having seemingly stuck Clary in the middle. The final look at the symmetry that existed inside of Clary, this push and pull between good and evil, Jonathan and Jace at opposite ends, was one of my favorite shots of the series. Jace’s voice has been an anchor that keeps her tethered to the person she wants to be for the entirety of 3B. However, it proves to be too faint to lure her back this time, and we witness an emptiness fall over her as she knocks Jace out and heads to Jonathan’s aid. But before Clary can reach her brother via portal, there is a breach in the Institute as the Seelies take up arms to bring down Jonathan. Lanaia, the Seelie Jonathan took refuge with after Clary left him, serves only her Queen. And that Queen wants Jonathan’s heart on a platter even if that means killing Clary to accomplish it. Bless Meliorn for at least pointing out that Clary would die in spite of his commitment to serving under her orders. Just as Lanaia is about to stab Jonathan, Clary arrives and takes her out first. Unbeknownst to Jonathan, Clary has fully embraced their sibling bond. His expression, a sort of pleased shock when she calls him “big brother,” is almost as terrifying as the blankness inside of Clary. Back from their time in the Praetor, it appears that all predictions I’ve had surround Maia and Jordan have been false. They are not in on what Luke has been assigned, nor are they provided guidance from the organization as Jordan has been let go from duty. Maia does not seem bothered by their return to the daily grind so long as they are together. Jordan has his doubts about his place in New York. No longer bound by duty, feeling lost and unable to provide protection to those who needed it the most, Jordan contemplates checking off items on his bucket list. But the longer he sticks around the Hunter’s Moon, the longer he gazes at Maia. As they clean up at the end of the night Maia tries to make it clear to Jordan that she did not forgive him because she thought he was going to die. Maia makes it clear that she did not say anything that she did not mean. She wanted to forgive Jordan and she wants him to stay. Jordan is committed to being a better person, a level of growth that Maia not only recognizes but respects. She needs help rebuilding the New York pack and establishing herself as their leader. In order to do that she needs someone she trusts to have her back and to ensure that the pack as a whole has a second in command they can lean on for help. This partnership is exactly what the pack needs to build a strong foundation on. It represents forgiveness, trust, loyalty, and perseverance. It is a reflection of a long, difficult journey, but in the end a way back to the way things were can be found. I relate to the entire Shadowhunter feeling about Halloween on a deep level. It is the worst. The injection scene, making Clary watch it, was very uncomfortable. I love when they bring demons into the mix. Compared other ABC/Disney creations, like Once Upon a Time, they are incredibly well done. Everyone wants to protect each other’s feelings so badly on this show and it seems like no one care about mine! Shadowhunters season 3, episode 19, “Aku Cinta Kamu” airs Monday April 22 at 8:00 p.m. ET on Freeform.